Stacey's ladybug diaper cake is an artful and airy inspiration that comes straight from the garden! 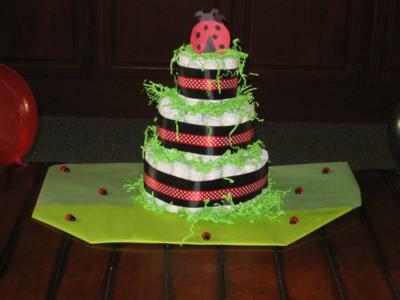 Ladybugs are an adorable theme for a baby shower and I'll bet that Stacey's cake added a splash of spring to the baby shower. I love the green, red and black - such a great color combo. Stacey shared her ladybug diaper cake to inspire the rest of us to create something unique...and she is part of our ever-growing collection of amazing diaper cakes submitted by our A-mazing readers. A huge thanks from all of us to you, Stacey! Love your cake! We'd love to see YOUR diaper cake pictures! Submit your photos and ideas right here. Very easy and fun! I used a glue gun on just the ribbon. It was very hard for me to find ladybug ribbon so I used two different kinds to get atleast the colors I wanted. The green-crinkled paper was just what I needed to make it complete! Enjoy!